Compact2025 is an initiative for ending hunger and undernutrition by 2025. It brings stakeholders together to set priorities, innovate and learn, fine-tune actions, build on successes, and synthesize sharable lessons in order to accelerate progress. Hunger and undernutrition impose enormous human and economic costs. Not only do they lead to misery, disease, and death for millions, but they also reduce global gross domestic product by US$1.4–2.1 trillion a year. Yet the tools to end them by 2025 are within our grasp. Success in ending hunger and undernutrition depends on country-owned and country-led strategies and investments. Compact2025 is a tool for countries that wish to achieve this goal by 2025. It helps them bring together the many sectors involved in food security and nutrition, build their own capacity, craft strategies, experiment with programs and policies, and make rapid progress. 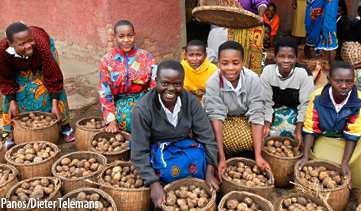 Compact2025 begins with an initial focus on four countries—Bangladesh, Ethiopia, Malawi, and Rwanda—which seek to accelerate their progress toward ending hunger and undernutrition. The initiative will then scale up to include additional countries. Compact2025 is creating a Knowledge and Innovation (K&I) Hub to provide policymakers and practitioners with pragmatic, evidence-based guidance on scaling up success stories to end hunger and undernutrition. The hub will serve as a place to find evidence, generate and share knowledge, and experiment with new, innovative ways to advance food security and nutrition. (IFAD), and the World Food Programme (WFP), that are already dedicated to accelerating the end of hunger and undernutrition. Moreover, by working to end hunger and undernutrition, Compact2025 supports a number of the Sustainable Development Goals (SDGs).